eBay today remains one of the most popular and safest online places to buy rare gold coins from sellers all over the world. eBay gold coins will not only provide a great investment into their actual gold value but will come with an added bonus of collectability value. At any given time, eBay customers can choose from almost 4,000 gold coin auctions to find the most valuable and desirable piece for each and every numismatist. This article will explain all major eBay gold coins pros and cons for novice collectors and investors. eBay is one of the safest online auctions to buy any type of coins, including certified gold coins due to its sophisticated feedback system. It’s essential to buy eBay gold coins only from sellers with high feedback scores to ensure authenticity and customer satisfaction. Pay Pal payment system is the only accepted way of payment on eBay that guarantees 100% buyer satisfaction. eBay selection is not limited to gold coins, here you can also bid on other rare collectible pieces like gold coin pendants and gold coin rings. eBay is the place to buy rare historical gold coins from all over the world, especially coins rescued from shipwrecks at a competitive price. Only you decide which bid amount to place and when to stop bidding. 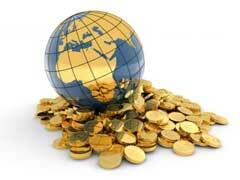 This guarantees that sooner or later you will get a great gold coin for an excellent price. Sellers’ mistakes do happen on eBay. When buying eBay gold coins, take care to inspect your purchases carefully upon delivery and let the seller know if the coin you received is not the same one that you had actually been bidding on. Purchasing gold coins on eBay with reserve auctions is not always advantageous for the buyers. On the contrary, eBay reserve auctions exist to protect sellers from being forced to sell too low. The general rule is to stay away from reserve eBay auctions as it might simply be a waste of time to bid, win an auction but never actually receive your coin due to a reserve limit not being met. If you are a type of collector who likes to carefully examine, touch and feel your potential gold coin purchase, eBay is not the place to acquire your next collection piece since you can only see photos of coins that are sometimes of inferior quality. eBay could be a great place for some collectors to acquire rare historical and gold proof coins. However, taking into consideration all cons and pros of buying eBay gold coins only from sellers with the highest feedback score will almost always guarantee buyers’ satisfaction and add great pieces into your collection.